Just before Thanksgiving I was listening to talk radio (local) and people were calling in on a casual discussion of listener’s Thanksgiving menu choices. I listened, hoping to catch an idea for something new and different to add to our menu. Since I was in the process of driving around town running errands, whatever “new idea” sparked my fancy needed to be something very, very simple that I could retain in my brain until my next stop so I could write it down. A lady called in and gave a recipe for a family favorite, “Sounds kind of grouse, but everyone loves it,” she said. Layer the three items in a glass dish. Simple, pretty, yummy. I figured – why not? I doubled the recipe. 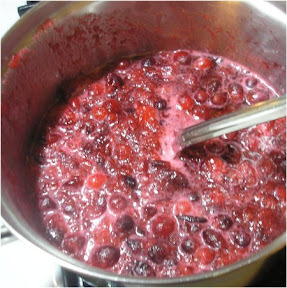 I made cranberries by taking 1 bag whole berries, 1 cup sugar, 1 cup water (directions were on the bag), boiled, smashed, cooled. This I layered with the other 2 ingredients, then covered and put it in the fridge overnight (the lady on the radio recommended this). I did not like it. I think if I had used pound cake or even bread instead of the Saltines, I would have been OK. But the Saltines rendered a texture and taste I wasn’t fond of. I was hoping for the “sweet, salty, cake-like melding” that was spoken of on the radio, but it turned out with a texture of something in a day-old lunch box – to me. Everyone else seemed to like it. It is a simple base idea, though, that could be used with another fruit (blueberries) or, like I said, a bread or cookie instead of the Saltines. So, though I might not make it exactly like the recipe says (or if I did, I would make it for a potluck or something), I will keep it in my “back pocket” of tricks to use creatively another time. I’ve seen something similar made with crushed pretzels; maybe that’s the trick. Maybe add some butter and prebake so it doesn’t sog up in the fridge. 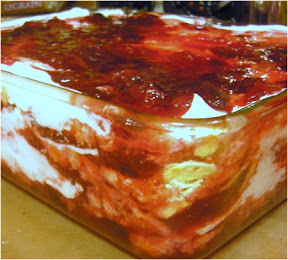 My girlfriend does something similar, but the layers involved crushed pretzels (mixed with melted butter), strawberry jello and some kind of cool whippy/cream cheesy concoction. = Yuck. Won't be buying or trying that again. - Not too bad, not too good. Lived up to expectations for me. - Yay. Love it. Recommend it. One mom, one dad, five kids. Living in a 3-bedroom house with one bathroom... more? Susan Probert said: What about the sunflower oil? ..
Nicole said: My 9 yr old just had his tibia wedges. It was excruciating. Feel like we are starting all over again.... ..
HowardPOids said: What we suffer with here is , superioroblation Simply click http://bit.ly/2Hp2XJy ..
Jordan said: Hi there!! I do know that you’re supposed to take yeast cleanse at night before bed so that you don’t... ..
raspberry pi 3 said: You can even have inexperienced tea or raspberry leaf tea. ..